How to join indian air force or navy after 12th science? i will be passing my 12th in this march,further i want to join defence am comfortable with two forces i.e navy and air force mostly air force.i want to know about the further process is there an university,or an exam or somthing else.i need your help for further scope? Is it right to join Indian Air Force/Navy after passing 12th? How to join Air Force, Navy and Army after completion of 12th Class with Commerce? How can I join Indian Air Force after securing 78% in my 12th with Science stream? Can I join Air Force or Navy after passing 12th science? Can I join Indian Air Force or Navy being a student of Science stream? Scope for dentists in Indian Navy and Air Force? Am I eligible for Indian Navy or Indian Air Force having scored 49% in 12th standard and with an age of 20 years? Re: How to join indian air force or navy after 12th science? how can i join navy or air force after 12th? i had heard that it cannot be join aftr 12th..so plz give me suggestion to join navy or air force..
yes,You can join Indian Navy after passing 12th standard through NDA(National Defence Academy)Exam.It is Organized by UPSC (Union public service).Twice in Every year.In months of April and September/October as NDA-I and NDA-II. If you are girl you have to complete your graduation from recognized University.after than you can apply the CDS exam.It is also conducted by UPSC twice in every year. -Age Limit::16.5 to 19 years. -Gender::Male and Female both are eligible. I hope this info will be help to you. Candidates who select in the written examination are called for Interview which is conducted by SSB. Syllabus for NDA: is attached in the file. can you explain the marks percentatage...for attend a NDA exam???? Surely you can join Indian Air Force or Navy after passing 12th science stream. For this you may apply for NDA(National Defense Service) . The examination of the NDA is conducted by UPSC twice in a year to recruits the candidates in Army, Navy & Air Force wings of NDA. the eligible candidates apply through online and offline application mode. (e)A person of Indian origin who has migrated from Pakistan, Burma, Srilanka or East African countries of Kenya, Uganda, the United Republic of Tanzania, Zambia, Malawi, Zaire and Ethiopia or from Vietnam with the intention of permanently settling in India. Provided that a candidates belonging to categories (b),(c),(d) and (e) shall be a person in whose favour a certificate of eligibility has been issued by the Government of India. (i)for Army wing of NDA 12th class pass of the 10+2 pattren of school education or equivalent examination conducted by a State Education Board or a University. (ii)for Air Force & Naval wing of NDA.A candidate must have passed 10+2 educational level with PHYSICS & MATHEMATICS subject. Candidates who are appearing in the 12th class under the 10+2 pattern of school education or equivalent can also apply. 5.Physical Standards : Candidates must be physically fit according to physical standards for admission to National Defence Academy and Naval Academy. (c) The minimum acceptable height is 157.5 cms. 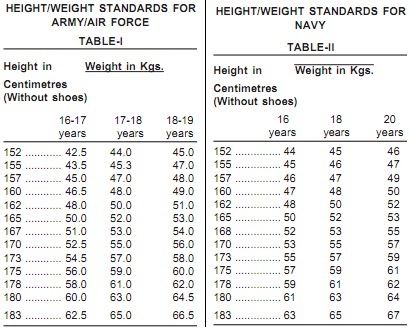 (162.5 cms for Air Force). Indian Air Force or Navy can be joined through NDA(National Defence Academy) entrance exam being conducted by UPSC twice every year. The eligible candidate aspiring to join Indian Air Force/Navy of NDA, must be an unmarried Indian Male having either appear for the final 12th exam or pass with Physics, Chemistry and Mathematics as subject of studies from a recognised Board within the age of 16.5 to 19 years with good Physical and Mental Fitness. The NDA can be applied through on line only and the selection is through written exam, personal Interview, Physical Fitness test and finally through Medical Test. You must have passed 12th or appearing. Your age should be in between 16.5 and 19 years. And you must be Physically fit. And you must be unmarried male. you can join Indian Air force or Indian navy by passing the NDA(national defence acadamy). the candidate should be passed the senior secondary class with PCM. the candidate should be lies between 16 1/2 to 19 years. If you uqalify this, you have recived the SSB join letter. SSB is a type of interview which run's till seven days. In this interview behavier skill and knowledge is cheked. After that physical standered is cheked. You can also join difence after graduation by giving CDS exam. If You want To Join in Indian Air Force After 12th Please Appear the NDA Exam. 1)The 10+2 or intermediate passed candidates are eligible to apply for NDA. 2)As NDA allows entry in all three wings,so it is required that candidates who have passed 10+2 with physics and maths are only eligible for air force and navy and with any stream for army. 3)Age limit is 16.5 to 19 years(at the time of commencement of the course,not at the time of applying). If you have passed 10+2 with Physics ,Chemistry and Maths then you are definitely eligible for Indian Air Force and Indian Navy. You can apply for NDA & NA examination which is conducted by UPSC twice in a year. Your age should be between 16.5 to 19 years and you should be unmarried Indian male citizen. The selection will be purely based on the marks in the examination. Physical fitness is the uppermost criteria and without it you will not be considered. So please make sure that you are fit according to the standards. So you can start your preparation for NDA exam because the competition is very high in this exam. After completing 12th standard with Science stream , you can join Indian Air Force or Indian navy through the National Defense Academy [NDA] Examination. The NDA Exam is conducted twice every year by the Union Public Service Commission as NDA-I & NDA-II in the months of April and August. As you have passed 12th, you are eligible to appear for the NDA Exam. - The Candidate must have passed 12th with PCM from any recognized board. - There is no any specific % of marks required in 12th. * Candidates appearing in 12th standard can also apply. - The candidate must have the age in between 16.5-19 years. - There is no relaxation given in upper age to any candidates no matter they belong to Reserved Category or Open Category. - Only Male candidates who are unmarried are eligible for the exam. - Girl Candidates are not allowed to apply for the NDA Exam. - The candidate must be an Indian Citizen. This is the information i ahve to the best of my knowledge regarding your query. Hope the information will help you to the extent you want. Let me tell you that you can join Indian Air Force or Indian Navy through National Defense Academy exam. National Defense Academy exam is organized by Union Public Service Commission every year for two times in April and August months. # Candidates must have finished their 12th standard with Physics, Chemistry and Mathematics from any approved institution. # Candidates of last year of 12th standard are also preferable for this exam. # Candidates must be unmarried male. is there any carreer options in indian armed forces after 12 for girls ?? how can girls join air force or navy?either after 12th science or after graduation. You can apply for the NDA exams after passing class 12th. Indian Airforce and Indian Navy Wing- 12th class or Intermediate Pass.In class 12th you should have studied the subjects Physics and Maths. Can i join CDSE after doing B.tech in biotechnology? am i eligible for CDSE? can i join airforce after 12th science. please answere the question. i am aakash chaudhary. my age is 18 year and 9 months on today(14 july 2013). my pcm% in 12 is 83%. sir i want to join indian defence wheather it is army, airforce or navy as an officer. please guide my how can i join. according to my age i can not apply by nda exam sir please guide me what is another ways to join. how can i join indian navy after 12th in science stream with 74.67%? To join in Indian Navy first you crack the examination that is NDA(National Defence Academy).NDA examination is conducted by UPSC(Union Public Service Commissin) twice in a year.i.e NDA- I and NDA - II. Indian Navy is one of the wing of NDA. Other two wings are Indian Air force and Indian Army. Candidates must have a 12th standard with PCM(Physics/Chemistry/Mathematics) subjects from a recognized state board for Indian Navy and Indian Air Force exams. **If you are Arts stream you are not eligible for this Indian Navy. There is no percentage required for this examination. Candidates age should be between 16.5 to 19 years. There is no age relaxation for this NDA exam. NOTE: Only Unmarried Male Candidates are eligible for this exam.Female candidates are not eligible for this exam. This Examination is conducted by Union Public Service Commission in yearly twice i.e. NDA have three wings i.e. Now, to become an Officer, you will have to first of all undergo training at the Air Force wing of National Defense Academy and to get admission in the academy, you will have to qualify NDA Exam conducted by Union Public Service Commission. Candidates who have studied Physics and Mathematics in the higher secondary level and within the age limit of 16.5 to 19 years are only considered eligible for the examination. To be considered eligible for the position of an Airman, you must have passed higher secondary examination with a minimum of 50% marks in aggregate and must have studied Physics and Mathematics in the same. As far as age limit is concerned, the minimum eligible age is 17 years and the maximum age limit is 22 years. 5.You must be unmarried male. WHAT IS THE MARKS LIMIT FOR GETTING QUALIFYING IN NDA ENTRANCE EXAM? first of all you have 80/.mark in pcm then yourr slection in technical line sure like nda. i am completed Bsc degree 2012 batch, Now My AGE is 23.am i eligible for navy and how to apply??? sir,any other exam accept nda to join iaf after 12th science? ?plz help me sir.